My great grandmother, grandmother and mom all cooked with cast iron skillets. They swore by them. If you don’t have a cast iron skillet, you need one! If you have recently made a purchase you will need to know hot to cook and clean with your cast iron skillet. Let’s face it; cast iron skillets are made of iron which makes them incredibly durable; they can take more heat than any other cooking device you have, and they are economical. 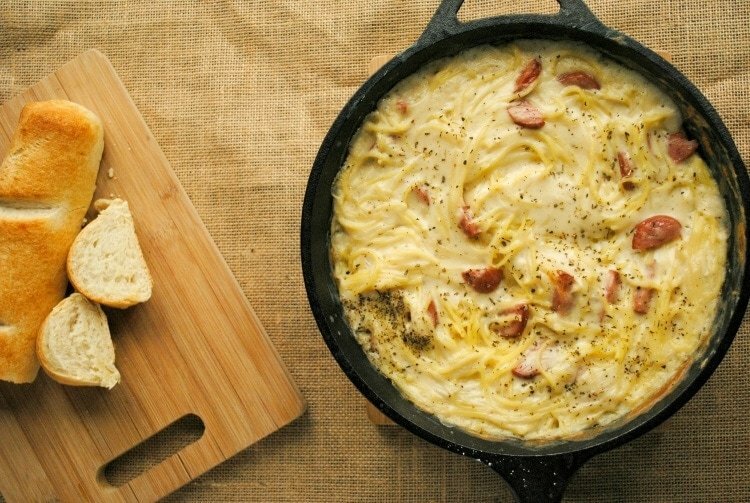 If you have a cast iron skillet, you want to treat it like part of the family! I decided to purchase one myself recently. I found a really great deal on the Lodge cookware set from Amazon. I have a feeling I will be cooking alot more with my cast iron skillet now. Cast iron skillets are very versatile. You can cook fried chicken, whip up the best sausage gravy, or grill a burger. Though you can cook just about anything on your cast iron skillet, you want to steer clear of acidic foods such as tomato sauce and citrus fruits. Always season your skillet before you use it to cook. Seasoning is a way of making your skillet non-stick. To do this, heat up your pan until steaming hot, add a spoonful of oil, rub on the bottom of the skillet, and let it cool. A cast iron skillet isn’t something you can just throw in the dishwasher. In fact, there are very specific steps when it comes to cleaning your cast iron skillet that you want to follow! • Scrape out any food or debris. • Wipe out excess oil and grease with a paper towel. • If you need to clean your skillet after this, it is important not to use harsh soaps. Clean with 1 drop of soap and warm water. • Dry your skillet thoroughly! If you use water, it is crucial that you dry your skillet using your stovetop when you are done. Because it is iron, the water can make it rust. • Re-season your skillet after you wash it. After you wash your skillet, the soap can make the bottom less than non-stick. Re-season your skillet after each cleaning. • Keep it clean. You want your cast iron skillet to be cleaned each time you use it. • Keep it seasoned. The better you season your skillet; the less food will stick to it. • Keep your skillet covered after you clean it. To prevent dust and debris from soaking into your skillet, cover it with a paper towel before you put it away. • Always repair rust. As with any iron piece, your skillet can rust. If it does, use steel wool to scrub away the rust, wash with dish soap, dry on the stove, and re-season your skillet several times. • Keep it out of the water. Water will cause it to rust, so make sure you always dry your skillet thoroughly. What do you love about your cast iron skillet? Share some care tips in the comments below! Recently, I made the most delicious Quick Cast Iron White Chicken Chili recipe. You may also like this Gluten Free Cast Iron Skillet Baked Spaghetti Recipe.